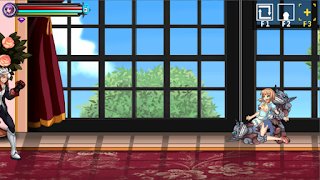 And more update about game; I add camera view in Sprites Gallery Room. You can toggle it by "F3". So you can change to camera view and leave player off screen, see all girls without player walking around. And fixed zoom, Player HP bar will stay in the same size when you zoom. So does this mean Patreon pre-order can download it right now? Sorry, just wait a it more. I will send a download link when game released on DLsite. My Patreon is pre-order and one-time paid. I'm didn't get amount of money monthly as other patreon. If some patrons share it on public before game released on DLsite. it's can make me doom >.<"
So since I paid for it on Patreon, I'll get it once it becomes available on DLsite, but I'll get it through a Patreon link? After game released on DLsite. 1.) I will post on Patreon. So patreon will auto send info to your mail about what news about my patreon. 2.) Then I will send a download link by Patreon message. 3.) I will send a link to patrons mail one by one as back up. This is best news in this year. And yes CG will be uncensored. ↑ This is your comment. Maybe, The dlsite does not allow uncensored version. If I buy the game from dlsite, how can I get the uncensored version? For patrons will receive uncensored version in the beginning. I'm very appreciative of your reply. Ahhh! 4 days passed and still not released on DLsite ! ?